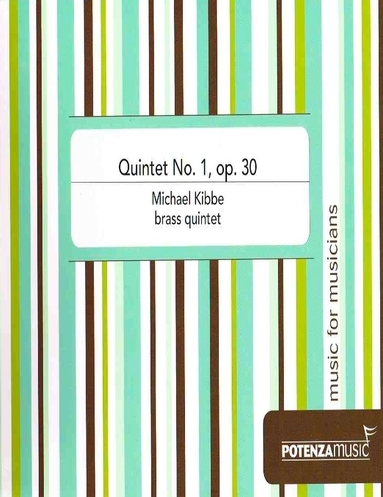 Kibbe’s first venture into composing for brass groups comes in the form of this four-movement brass quintet. The work was composed over 40 years ago when Kibbe was teaching at Cameron University in Lawton, Oklahoma. After reading through the work with my colleagues, it was immediately noted how it seemed as if the composer was studying a lot of Hindemith at the time. This was an astute observation, as Kibbe’s own description of the work is “a neo-Classical style, similar to the works of Hindemith.” Additionally, there are elements of serialism involved as a couple of movements utilize melodies that can nearly be extracted from 12-tone rows. The movements contain winding harmonic textures that rarely resolve. Kibbe also utilizes polyphony throughout much of the work, creating a soundscape similar to what a Hindemith madrigal would sound like. The individual parts do not pose any major technical challenges on the performers. Although mixed meter is incorporated, it typically makes use of simple meters with the exception of the third movement, which is predominantly in 9/8. The work is playable by an undergraduate brass quintet.